Brazil's unelected president wants to pass a draconian pension reform -- and a general strike may be the only chance to stop him. In the municipal elections following Temer’s ascension to the presidency, it appeared that his “bridge” would be fortified by an unchallenged right in every corner of the country. Temer’s party won almost a thousand mayoral races, making the PMDB the ruling party in one-fifth of the country’s municipalities. Coming in second was the right-wing Brazilian Social Democracy Party (PSDB), which also conquered hundreds of municipalities and pulled off a huge coup with the election of its TV businessman candidate João Doria to the mayoralty of South America’s largest city, São Paulo. The PT, on the other hand, suffered setbacks everywhere, losing 60 percent of the cities it controlled in 2012. Perhaps that’s why, in December, Temer imagined his latest attack — a draconian pension reform — would go down easier than it has. The original proposal would set a new minimum age for retirement — sixty-five years — eleven years ahead of the current average retirement age. The bill mostly applies to younger workers, but men over fifty and women over forty-five would suffer a 50 percent increase in their remaining contribution time — economese for “now you have to double the time you work for the pension you’ve already earned.” It would also add five years onto when low-income elderly could begin collecting extra support. It would delink pensions from the already-low minimum wage. And it would seek to eliminate special provisions for Brazil’s public-sector workers, a move clearly in keeping with Temer’s broader privatization agenda. That is unlikely. The bill is part of a comprehensive attack on workers’ rights that promises to wreck young workers’ prospects for decades to come. In an effort to bring Brazil’s labor standards in line with the priorities of multinational corporations, Temer is also championing a bill that would allow companies to outsource any job; extend the maximum duration of temporary work contracts from three months to nine months; and end the eight-hour workday. 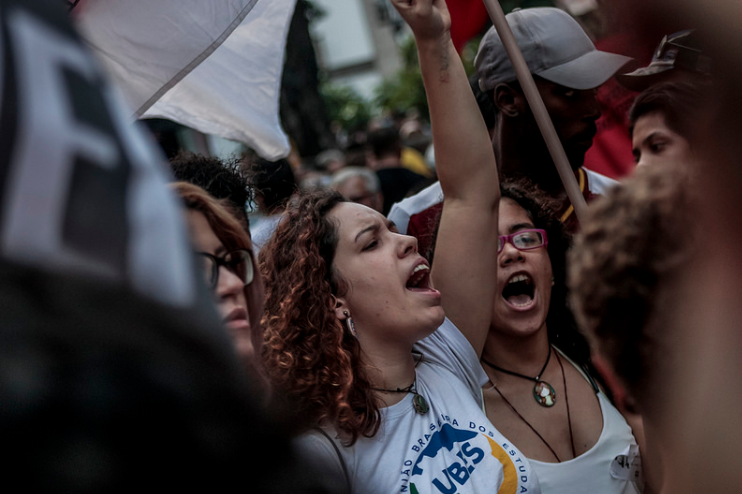 If these reforms pass, young Brazilians would face a grim future of more precarious work, fewer benefits, longer hours, and dwindling hopes for retirement. Unsurprisingly, both the pension reform and Temer himself are massively unpopular, and after last week’s explosive corruption allegations targeting nearly a third of Temer’s cabinet (and many of his congressional allies), one wonders whether the interim president will have the political capital to pull it off. Even before the corruption charges, Temer’s approval rating was hovering at just 10 percent — the same place Rousseff’s stood on the eve of her impeachment. That’s what the PT, Brazil’s massive union federations, and the smaller but forceful socialist left are hoping to capitalize on with this Friday’s general strike. While Brazil hasn’t seen a general strike in thirty-one years, Friday’s action looks promising. After all, just last month, mobilizations against the reform drew hundreds of thousands of people across the country. On March 15, Brasília, the country’s capital, witnessed roughly five thousand protesters, some of whom invaded and occupied the finance ministry. In São Paulo, partial stoppages by public transportation workers snarled the city in traffic, and teachers’ unions halted classes for the day. The union federations, realizing the blatantly anti-worker cast of the measures, have been unanimous in their call for a strike. Even the Força Sindical, whose director Paulinho da Força supported Rousseff’s impeachment and defended the corrupt right-wing politician Eduardo Cunha, has thrown its support behind the action. The PT still maintains a fierce hold on the unions, especially the Unified Workers Central (CUT), the largest union federation in Latin America with roughly 7.4 million members. If the strike is successful, the PT could re-buff their image as the rightful defenders of Brazil’s workers and even of the same middle class — in particular, the public workers targeted by the reform — who took to the streets last year to demand Rousseff’s expulsion from office. What Lula failed to mention in his recent speech was his own checkered record. In his first one hundred days in office in 2003, Lula placed pension reform at the top of his agenda, and like Temer, his plan targeted provisions for public workers and raised the retirement age by nearly a decade. So determined was Lula to pass the measures that he strengthened the PT’s relationship with the PMDB while isolating and ultimately expelling the PT left. It was this move that elevated the PMDB, the ultimate author of Rousseff’s impeachment, to greater importance in national government. And it was the purge that led ex-PT leaders Luciana Genro, Heloísa Helena, and Babá and João Fontes to found, with other left elements, the Party of Socialism and Freedom (PSOL), now the most electorally significant left party in Brazil. Because of this sordid history, and the PT’s continuing troubles with corruption, the Left has a chance at making a productive intervention in Friday’s mobilizations. While PSOL lacks the traditional union strongholds, they have made inroads with public workers in metropolitan centers, like teachers, nurses, and some metro workers. They have also successfully captured much of the energy of South America’s feminist and student movements, with their youth convergence this month attracting roughly 1,500 students from across the country, including Ana Julia Ribeiro, the sixteen-year-old who delivered a powerful speech last year defending the anti-austerity school occupations. These gains among younger workers, who are less incorporated into traditional union structures, will be crucial for coalescing long-term coalitions against austerity. They are free of both the PT’s neoliberal policy history and brushes with corruption, putting them in a better position to reach those disaffected with the political process. It is, after all, that disaffection, and not the Right’s popularity, that led to the PT’s decimation in last year’s municipal elections. Despite Brazil’s mandatory voting system, abstention rates were the highest they’ve been since 1988 — the first general election after the military dictatorship. A fourth of voters didn’t show up at all, and more turned in blank or null votes. In São Paulo, the number of people who abstained or nullified their choice was higher than the number who voted for the now-mayor, João Doria. In this sense Friday’s strike is a testing ground to see who can emerge as the protagonist of Brazil’s left. It is entirely possible that the PT will be able to exploit the widespread opposition to Temer and maneuver Lula back into the presidency. Yet the party’s political program was seriously compromised the last time it was in power, and it’s unclear whether they have a plan to avoid falling into the same traps. With the dissolution of the party’s left — the one faction potentially capable of creating such a plan — there’s little reason for optimism. A PT mandate that fails to benefit workers could easily cultivate Brazil’s more noxious extreme right, exemplified by the far-right Jair Bolsonaro, while repressing and enervating the socialist left. In preparation for Friday’s strike, the socialist left has been carefully cultivating a coalition of left-wing unions, feminist currents, indigenous groups, and student movements, all of whom increasingly see themselves as independent from the PT. Students in particular, who last year shut down over a thousand schools, have proven themselves an electric force capable of articulating an alternative politics. This coalition has the potential to cohere an energetic pole of opposition to Temer that is also free of the compromises of the PT. Still, the most crucial measure of Friday’s strike is whether it can stop Temer’s disastrous measures. In the face of such militant opposition, Temer’s government has taken on a Kamikaze-esque strategy to push through the reforms. Finance Minister Henrique Meirelles was seen arguing in the Financial Times that “the unpopularity makes it far easier for the government to try to do something ambitious . . . they have nothing to lose.” He also noted that as a result of the impeachment process, the current (unelected) president is more unified with the conservative parties dominating Congress than any other in decades. The neoliberals in power are betting that this ruling consensus can outweigh the popular, grassroots one. The Brazilian left’s challenge is to prove them wrong.